Stay hot on Vargosi's trail in his search for the mythical Moon Well. "It was fun. It is easy. It isn't as challenging as a couple of the others, but I like ALL The Incredible Dracula games, and this one fits in with the rest. I like the fact we that have a different character, but it is basically the same fun game with new puzzles." It's time for the lady of the castle to take charge in this thrilling adventure featuring a role-reversal twist no one saw coming. When Dracula's old nemesis, Count Vargosi, escapes captivity, he has one thing on his mind: reaching the Moon Well, a magical place where he can become invincible. Normally, Dracula would try to stop Vargosi on his own, but he's away when the news breaks, so he asks his wife, Elizabeth, to search for the villain on her own. 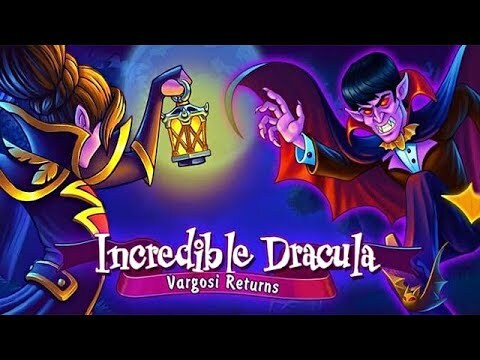 With the countess in charge, Rufus, Vladdy and the rest of the gang must stay hot on Vargosi's trail as they complete challenging missions packed with exciting quests, unique obstacles and zany characters. Break from the ordinary and unlive a little with Incredible Dracula V: Vargosi Returns.